Exactly?? I don’t know what Laurie Garrett’s area of expertise is. Before this interview was brought to my attention on Twitter, I’d never heard of her. But she obviously knows very little about genetics, crop science, or weed management. This exchange is really quite baffling to me. Ms. Garrett apparently thinks that the 24 different “superweeds” (I presume she really means glyphosate-resistant weeds) have become glyphosate-resistant by “absorbing strange genes” from Roundup Ready wheat. The most troubling part, to me, is that she begins her statement with “The one thing we know…” and then proceeds to say something that is a complete fabrication. Of the 24 weed species confirmed to be glyphosate-resistant, not a single one became resistant by hybridizing (or “absorbing” a gene, as Ms. Garrett describes it) from a crop. All glyphosate-resistant weeds found to date have evolved due to selection of naturally occurring resistant biotypes within a population by repeated use of the herbicide. Absolutely no crop transgenes have ever been found in a glyphosate-resistant weed. This could be possible in the future, particularly in the case of crops with closely related weed species (such as wheat and jointed goatgrass). But it has not happened to date. I don’t see anything in Section 735 that says anything about not being able to sue Monsanto. This paragraph gives absolutely no protection to Monsanto whatsoever with respect to GM wheat being found in Oregon. Perhaps Ms. Garrett was talking about a different provision put into a continuing resolution? 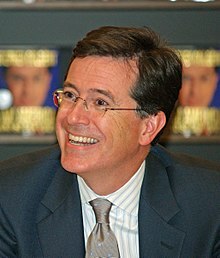 I realize that the Colbert Report is a comedy show, and that his shtick is to be over the top. I personally watch the show regularly and think it is quite funny. So it’s difficult to be too upset about this. But during the interview, Laurie Garrett makes two claims, both of which are completely untrue. Personally, I would be a little wary of going on ANY show, even a comedy show, and simply making things up. Particularly if I wanted to keep any sort of credibility as a Pulitzer Prize winning science journalist.